I’m guessing that only North Carolina readers are going to get this story, and maybe not all of them. I spent the last couple of the days up near Asheville/Hendersonville. I had to drive out from where I was staying to get a signal for my cellphone and iPad (no computer). Wanting to at least be able to do a little bit of web surfing I went down to the AT&T store to complain about it. The AT&T person mutters as she’s typing in the location, “If there’s a 'Cove' in the address we sometimes don’t have good coverage.” Not a good sign. For those not from around here, “cove” is North Carolina-ese for “hollow”, or valley, or “way back yonder.” There was a cove in the address and there wasn’t coverage. No fix. I found that the Bulls had lost four in a row up until this morning. And now they have lost five in a row and have been swept by the Columbus Clippers. Let me jump to my first chart to show what that means. 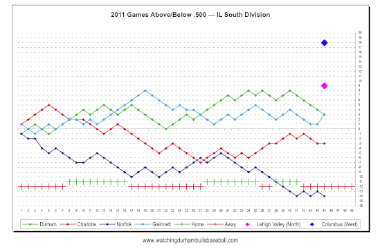 At first while the Bulls were falling of the edge of the earth, the Gwinnett Braves weren’t doing all that well either. But today they caught up with the Bulls and now the Bulls are tied for the first place lead. How did that happen? First of all, Columbus is one heck of a team. 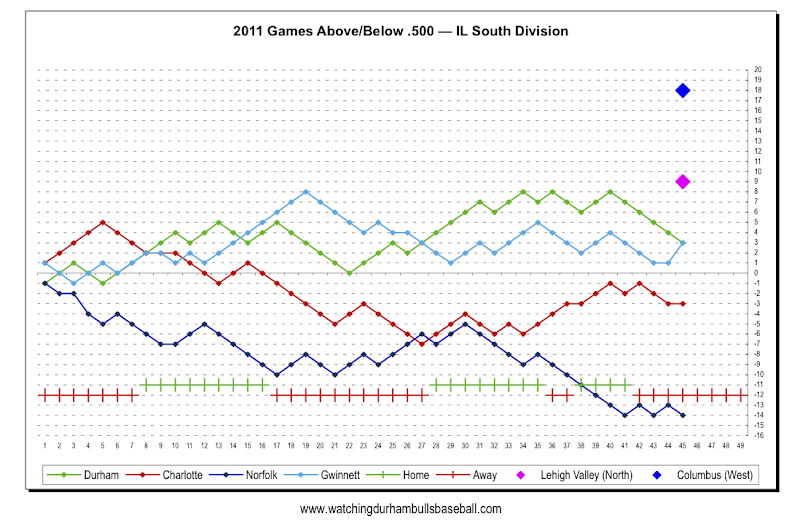 As the chart shows, they’ve been on a run all year and don’t look to be slowing down the least little bit. In the Bulls defense (and this is just from the obvious, reported stuff) the turmoil on this trip has been unusually high. Two hitters, Ruggiano and Lopez, got called up to the Rays. While I was not yet a fan of Lopez, I have to admit his league-leading week before his call-up was special. A pitcher, Rob Delaney, came back and was banged around a bit at first. Chris Bootcheck got a try-out as a starter in game 1 of the Clippers series and gave up 5 earned runs in 3 2/3 innings. He took the loss, but I must point out that the next two pitchers (Delany and Hall) gave up 6 more runs (4 earned). Edgar Gonzalez only lasted one inning in his start in game 2 of the seris. The bullpen kept a lid on (sort of) through nine, but Mike Ekstrom wild-pitched in the winning run in the 10th. Over the last five games the Bulls have scored 27 runs, pretty good and usually good enough. Unfortunately their opponents have scored 35 runs. But only 26 were earned. What does that mean? It means there were a few mistakes (3 errors, 1 passed ball, 2 wild pitches), but that’s not terribly bad, just that the timing of the mistakes was terrible. 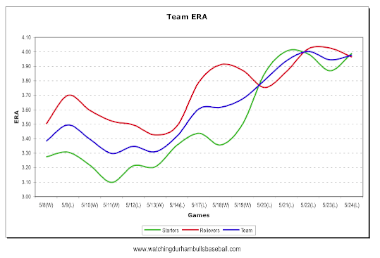 In terms of pure numbers, the Bulls team wOBA at the beginning of the stretch was .338 and at the end it was .339. So I guess we’ve got to blame the pitchers. This chart pretty much says it. 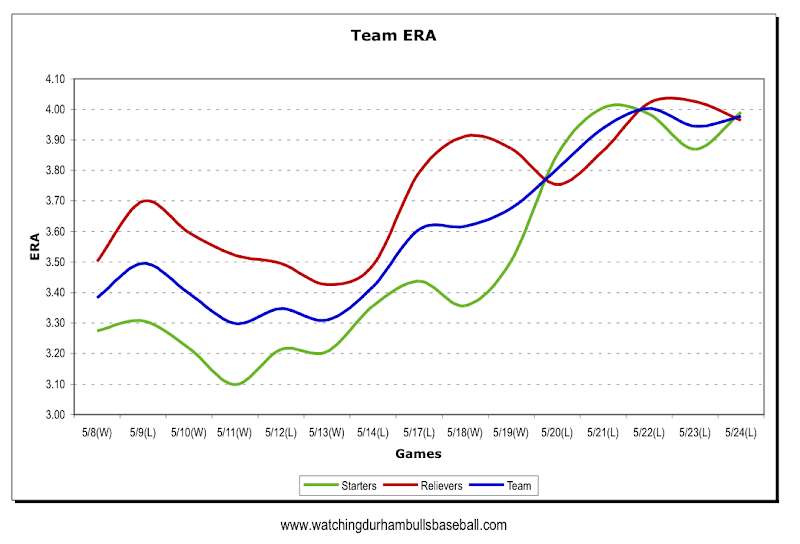 The team ERA and the ERA of the starters and relievers has really ramped upwards over the last several games. And the trend started even when the Bulls were winning. The Bulls get a day off in Toledo tomorrow. The Tigers’ AAA team, the Mud Hens are 22-25 so far. Maybe Dan Johnson will show up and hit a couple of dingers for the Bulls and life will settle back down. We can hope. please, pretty please, record a score the proper way; put the winning team first! Not quite sure that winner-loser is "proper". Could be: home-away (box score); or, my choice so far, Bulls-Opponent. But, since you asked so nicely, I'll give it a try.